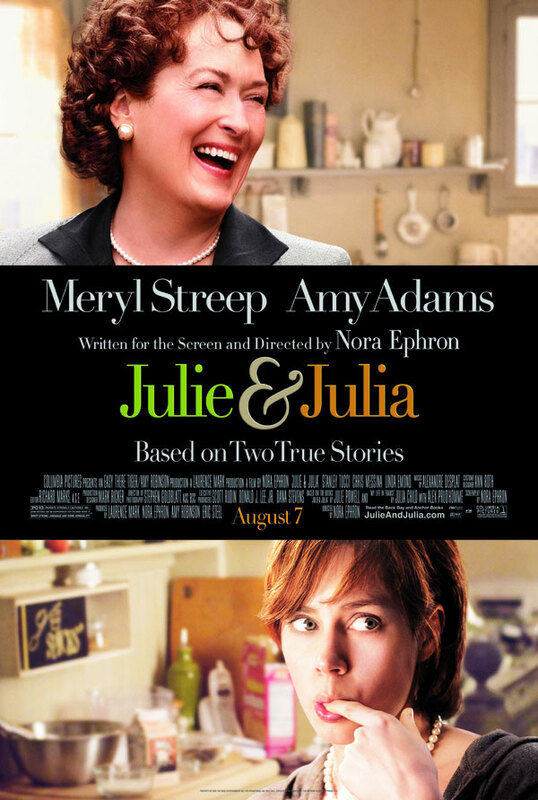 Meryl Streep is Julia Child and Amy Adams is Julie Powell. Writer-director Nora Ephron may be familiar to those romantic-comedy watchers as she penned “When Harry Met Sally”, “You’ve Got Mail” and “Sleepless in Seattle” among others. So combining the two stories of these women was bound to have that warm, comforting feeling, like a Mom’s hotdish. Learning about Julia Child and her carefree, “eat what I want” attitude was inspiring! When she asked her husband what hobby she should take up he responded “Well, what do you enjoy?” To which she said, “Eating! Look at me, I’m growing in front of you.” This wasn’t followed by a scowl or reaffirmation, instead they giggled and shared in her passion for relishing the food. And Julie, the down-trodden New Yorker who hates her job but loves coming home to cook. Her self-disciplined quest is to cook 524 recipes in Julia Child’s “Mastering the Art of French Cooking” in a year’s time. I’m part of the generation that learned about cooking from Home Ec 101 and the Food Network. BAM! and Emeril, right? As my interest in cooking increased my Mom noticed and one Christmas I received three paperback cookbooks: “Mastering the Art of French Cooking,” a Pillsbury baking book and something else. Through the several moves and downgrading of materials I’ve seemed the keep one of those cookbooks, Julia’s. Though I haven’t done the in-depth job that Julie Powell did, and the closest I am to that is having done maybe 20 out of hundreds of Rachel Ray’s recipes, I am LOVING food blogging. Like Julie, and hopefully some day Julia, I will follow my way through volumes of gourmet recipes to feed my family, feed my cooking bug and find my own style in the kitchen. See the movie, it’s out Aug. 7 and seriously made the entire theater laugh out loud at least 10 times!